Kleefeld on Comics: Crossover Genius Or Crossover Fail? Crossover Genius Or Crossover Fail? So by a complete accident, I stumble across Gary Anderson's deviantART page. He has posted quite a number of drawings of various characters from a wide variety of pop culture references. Since they were all done in the exact same style, and utilized a fairly blank background, it occurred to me that I could pick and choose several characters to create a dream crossover of sorts with a little help from Photoshop. There'd be NO WAY you could realistically obtain all of the licenses to get something like this to work. Plus any sort of story built around this type of thing would be more fanservice than anything actually even halfway decent. It would almost have to be done as a comic since actor Jon Pertwee is dead, and both Gil Gerard and Masaaki Sakai are well into their 60s. (So is Peter Mayhew for that matter, but it'd be less noticeable on screen given his costume.) I suppose it could be animated, but then you'd still have to try to replicate Pertwee's voice. Janet Waldo is in her 80s, and retired a decade ago so you'd probably need to get another actor there too. So I envision this as a comic. Kind of cross between Secret Wars and The Dirty Dozen, I suppose. But I find it mildly entertaining to imagine some of the character interactions with this group. Picture a conversation between the Doctor, Chewbacca and Kryten. 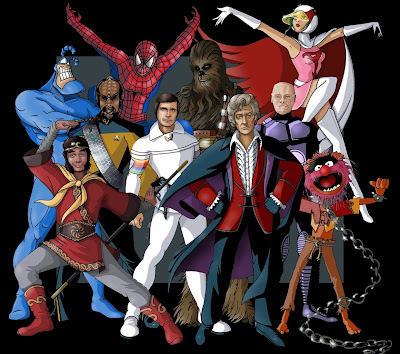 How long would Worf be able to tolerate either Spider-Man or Sun Wu-Kong? Who would start hitting on Princess first: Animal or Buck Rogers? Anyway, that's the type of stuff that rolls around in my head sometimes. Last Day For 10% Off Comic Book Fanthropology! I'm Gettin' All Social Media On Your Behind Now! "I Did It! I'm Free!"